How Can I Join the TPOBC? 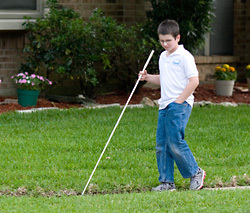 Texas Parents of Blind Children dues are $10.00 per family per year, which includes a subscription to Future Reflections. (Non-members are asked to make a subscription donation of $15.00 per year.) Members of the TPoBC are also members of the National Organization of Parents of Blind Children (the national parent group) and members at large of the National Federation of the Blind. Please fill out and mail the membership form along with your dues to TPOBC at the address at the bottom of the form.